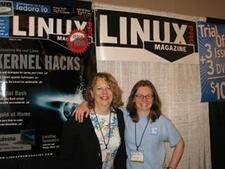 Last August, I interviewed Beth Lynn Eicher, co-chair of Ohio LinuxFest. In this interview, we hear from her Mom! A: My name is Susan Rose and I live in Pittsburgh, Pennsylvania. For the past 25 years I have worked as a registered nurse in Federal Employment. I remember paper charting and the switch to the blue screen VistA in the early '90s, and later to the CPRS Version of VistA. I just came back from a medical conference and it looks like we will move to a web-based [medical] record. provider to make a change in treatment or prescription. Anticipating the next move — and not letting the medical provider make a mistake — is the work of every good nurse. Because of the computerized record, I can practice at a much higher level of critical thinking. Q: What are you doing for Ohio LinuxFest? A: It was only last year that someone pointed out to me that CPRS/VistA is open source, too! Because my daughter was already affiliated with the Ohio Linux Fest — I am also known as "Beth Lynn Eicher's Mom" — I was asked to present at this convention on the this open source medical topic. Now there is a nursing CEU-approved two-hour class titled The Electronic Medical Revolution [pdf] that brings together many of the improvements and future trend that people should know about. A: If I could speak to a group of women, it would not be to come to open source as a career, but to just use open source — and to realize when they already are! I was coming to OLF for years before I realized that I work daily using an open source program. Also, women could save a lot of money when they could ”just say no” to the stick-up imposed when the trial version of MS office runs out on that new laptop. A: It would be good to interview the various generations about the attraction/meaning/purpose they find in the open source life. For example, Baby boomers, Gen X, Gen Y, etc. I would answer that the Baby Boomers and the younger generations have a special bond. Speaking as a boomer, when we were their age (in the summer of love, ’68), we wanted to "make love, not war" and save the world. Liberal boomers and college voters were hand-in-hand in the anti-establishment that helped elect a new president. The boomers finally have enough time, energy, wisdom, and money to make a difference and leave a legacy. The young adults have the tech-savvy and the idealism to really finish the job. Q: Have you ever heard the phrase, "But does it [referring to something technical, often in Linux/open source] pass the 'mom test'?" You're a mom, so how would you answer this question? A: I had to look up mom test and found: “The Mom Test measures whether the average non-techy person will be able to both easily use and see the value in a product.” Using this definition, I could say that the concept, idealism, and practicality of open source passes the Mom Test. Ohio Linux Fest 2010 passes the mom test. Watch Susan Rose's talk, The Wonder Years: A challenge to baby boomers to reclaim their vision for peace and love, as seen in 1967-68. What do you currently do in open source? What do you love about it? You're speaking to a group of women from other fields who are considering switching careers. Why should they consider moving into an open source-related career? What should they know about the open source environment to prepare them for the transition from a different field? Or: You're speaking to a group of high school students (male and female). Why should they consider exploring career options in open source? What question do you wish I'd asked? And how would you answer it?